Discovery Channel’s ambitious “Racing Extinction”(Discovery, 9 p.m.) flits all over the globe with stories of endangered species and mankind’s vast acceleration of the process. But it seems guided by the notion of one guy in L.A. who was outraged that a tony sushi restaurant was caught illegally serving up whale to customers and there were no ramifications. So after animal rights protesters went home after one day, the man set up a projector to vividly show on the restaurant’s exterior the crime they had committed. Night after night he showed the images of whales, for more than a week. In 10 days, the restaurant closed. The action reinforced the idea that one person can make a difference, as well as the notion that projecting effective images can change minds. So the producers of the film, who had previously made the world pay attention to whale and dolphin killing in the film “The Cove” began to project their images of endangered species on the sides of buildings, landmarks and now, across TV sets worldwide. Using Discovery’s global reach, “Racing Extinction” is showing in 240 countries and territories today, aiming at an audience of 1 billion. “When you are trying to create a social movement, you need to create that tipping point,” director Louie Psihoyos told reporters at the TV Critics Association summer press tour. It includes footage deep inside illicit markets in Hong Kong with vast holdings of shark fins and demonstrates the mass hunting of manta ray for similarly dubious medicinal use. In those cases, a one man approach is lauded — as when a shark hunting culture is turned around into of of shark tourism. Locals could make more money taking tourists around to see and swim with sharks than they could lopping off fins, it turned out. There are heartbreaking shots capturing the last unrequited love call of a soon to be extinct bird, who can’t find a surviving partner with whom to mate. And shots of capturing one of the last of a species just to photograph it, and raise awareness. Working with the Oceanic Preservation Society, there is a lot of focus on marine life. But then it switches to farmland and the production of methane gas by cattle (which is captured in mattress sized bags on their backs). 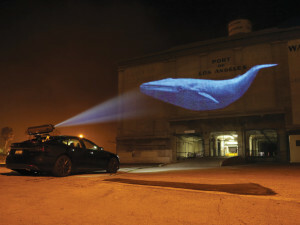 “Racing Extinction” may have had bigger impact had it been showing on Sunday night, on the eve of the climate talks in Paris. But Discovery was busy showing “Alaska: The Last Frontier” and “Bush People.” Maybe they’ll project it on the side of a building.